Gargamel is up to his old tricks in Capcom and Beeline Interactive's free-to-play effort, Smurf Life. 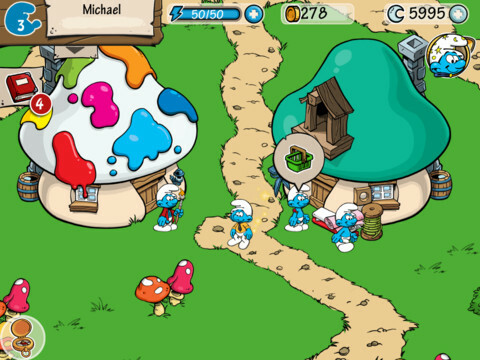 The follow-up to Smurfs' Village, this iPhone and iPad title does a fine job capturing the spirit of the Smurf franchise while at the same time incorporating freemium features that by now should be familiar to iOS users. How long you intend to play heavily depends on how much you're willing to pay, but you already knew that, right? This time, Gargamel casts a spell that covers Smurf village in darkness, and it's your mission to bring daylight back to this otherwise happy place. What's interesting (at least initially), is the option to research either Construction or Alchemy, with each introducing you to unique characters and quests. Now before you scratch your head over making what appears to be a tough decision, keep in mind that the basic quests remain more or less the same, in theory. It's just the resources that change. For instance, the Construction side deals primarily with wood, while Alchemy utilizes stone. Not only that, but inevitably, you're able to learn both. The basic mission structure involves collecting the proper ingredients, putting them together and claiming your reward. Smurf Life is also an energy based game, and there's only so much to go around before the little blue guy or gal grows fatigued. On top of that, Moon Dust functions as a means to speed up tasks. Naturally, it's limited, and Capcom presents the opportunity to buy more through in-app purchase. Coughing up a couple bucks is ideal, since the game quickly becomes time consuming. Beyond that, you'll more than likely dig the old school presentation, clearly designed with the 80s show in mind. The basic yet effective cartoon graphics have a nostalgic feel, while the cheery music will certainly put you in a Smurfy mood. As for negatives, not being able to view the map through simple finger scrolling is somewhat of a downer. This aside, Capcom delivered the usual free-to-play experience, and fans of the Smurfs will get a kick out of seeing a handful of familiar characters, Papa Smurf included. 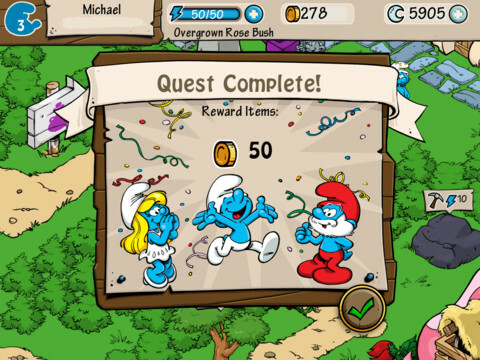 What's Hot: No shortage of quests to complete, familiar Smurfs from the classic TV series, music will put you in a happy mood, two different disciplines to learn, free. What's Not: You can't scroll to view the map, heavily dependent on in-app purchases.